1. Preheat the oven to 200˚C, gas mark 6. Toss the cauliflower with the olive oil, cumin and chilli. Season and tip into a large roasting tray (you’ll need space to add the mackerel later), and roast for 12 minutes. 2. Meanwhile, mix the paprika and 2 tsp lemon juice to make a paste and brush over the mackerel. Add the fish to the roasting tray and cook for another 8 minutes. 3. Mix the tomatoes, onion and mint, toss with the remaining lemon juice and season. 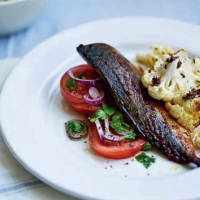 Serve with the roast cauliflower and mackerel.